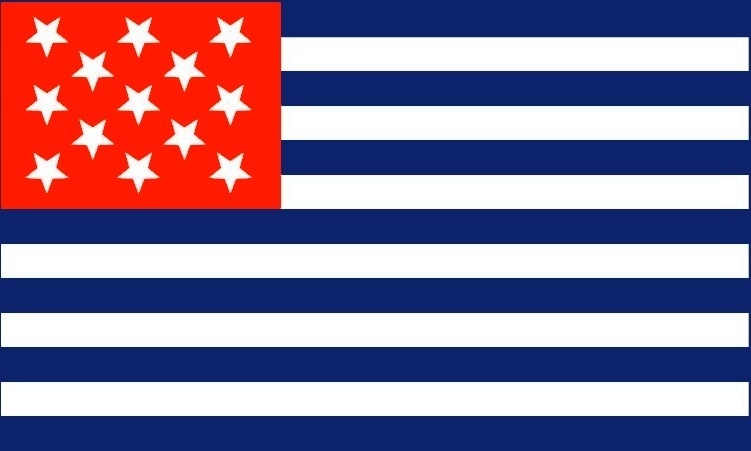 The 13 Star Flag is the most common and popular colonial flag to this day, yet many people are unaware of its history. It became the official flag of the United States on June 14, 1777, now known as Flag Day. You may have seen many variations of this flag, such as the Betsy Ross Flag, the Cowpens Flag and the Guilford Courthouse Flag, and all are correct. The original Flag Resolution did not specify how the stars were to be arranged in the field of blue, so many different arrangements were used. You can learn more about the 13 Star Flag below. You can order your own 13 Star Flag as well. Prior to American Independence, a great many different flags were used by American colonists for military regiments and for shipping. These flags were usually variations of already existing British flags since the colonists were British subjects and the colonies were part of the British Empire. Notice that the resolution says the stars should represent "a new Constellation," but does not specify how they should be arranged. It does not say how many points the stars should have. It does not say how wide the stripes should be or how long the canton (the upper left corner) should be relative to the rest of the flag. It does not say whether the red stripes should come first, or the white. Because of this lack of specificity, 13 Star Flags of many varying designs were used for many years. Over time, certain versions became more common and eventually, Congress defined more clearly what American flags should like. 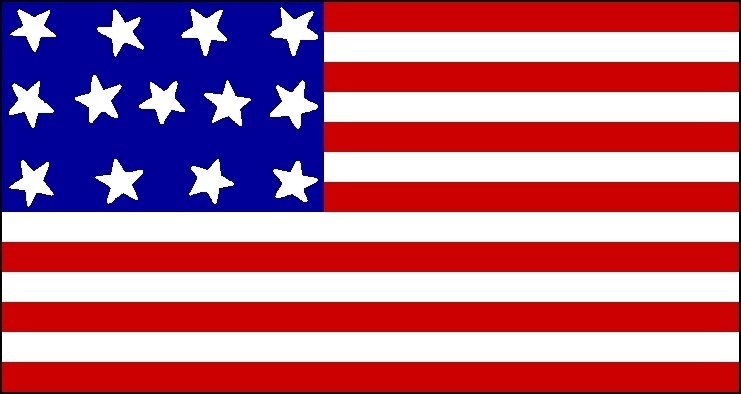 It is generally agreed that the stars on the 13 Star Flag were chosen to represent the 13 colonies and that the stars replaced the British Union. The Union was the familiar symbol of the British flag which represented a "union" of the Cross of St. George, the symbol of England, which was a red cross on a white background and the cross of St. Andrew, the symbol of Scotland, which was a diagonal white cross on a blue background. The Union flag was created when Scotland and England joined as one empire in 1707. Later the Cross of St. Patrick was added when Ireland joined the union in 1801. The Cross of St. Patrick was a diagonal red cross on a white background. The combining of the three crosses makes the British flag we are familiar with today. You can see the British Union symbol in the canton (upper left corner) of the British Red Ensign flag at the right. It should be pointed out that there is a lot of disagreement among historians about the development of the American flag. There are discrepancies in every proposed timeline. There are facts supporting and facts against every traditional flag legend that you may have heard. 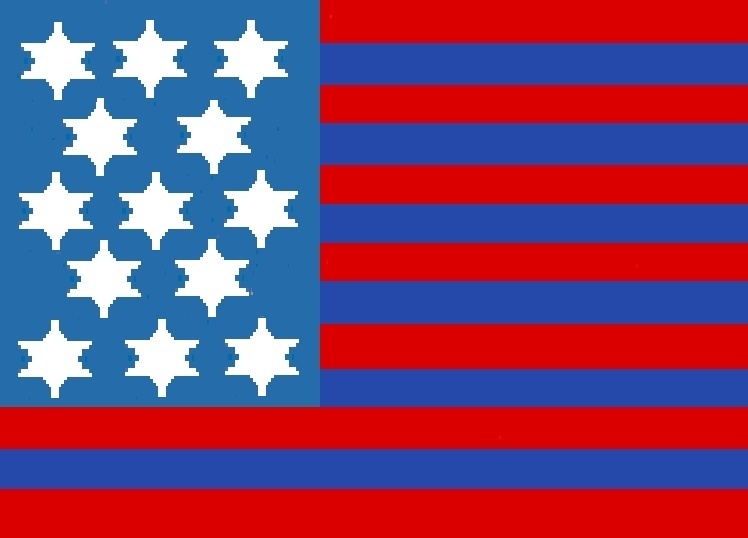 For example, the 13 Star Flag commonly called the Hopkinson Flag, with the stars in a 3-2-3-2-3 pattern, is sometimes called the "First American Flag," but there is no written documentation that has been found to indicate this. There is only circumstantial evidence, such as that Hopkinson was head of the Navy Board when the Flag Resolution was passed and that Hopkinson later submitted a bill to Congress asking to be compensated for creating the flag. Then on the other hand, there are facts that weigh against this view, such as that Congress denied paying Hopkinson based on the fact that "many" people had contributed to the flag's design and that there is no documentary evidence of what Hopkinson's flag drawings may have looked like. Another American flag legend you may have heard regards the Betsy Ross Flag, the 13 Star Flag with the stars arranged in a circle. Many people take the Betsy Ross Flag legend as fact, but there is absolutely zero documentary proof of the story. 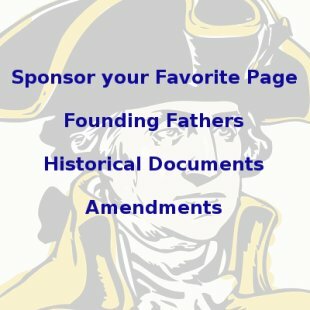 That being so, there is quite a bit of circumstantial evidence that makes her story seem likely, such as the fact that Betsy knew George Washington personally and another member of the secret flag committee that allegedly approached her was her husband's uncle, George Ross, a signer of the Declaration of Independence. The original Flag Resolution of 1777 was first presented to Congress by the Marine Committee. So when the resolution was passed, it was considered as a regulation regarding naval affairs. 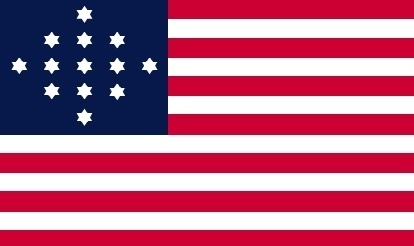 This has led historians to question whether or not the 13 Star Flag was used mostly by the navy and rarely by the army, or whether it was used equally by both. It would seem logical that since the resolution was presented by the navy that the navy was using the flag. There is evidence, however, in both letters and in paintings of the era that the 13 Star Flag was used on the battlefield. Artwork from Charles Willson Peale and Jonathan Trumbull, both preeminent artists of the day, showed 13 Star Flags in their battlefield depictions. Some historians have claimed that these flags are anachronisms, meaning they are accurate depictions, but out of the proper time slot. This seems unlikely, however, because both painters were known for studying their subjects meticulously to try to depict them accurately. Peale painted many founding fathers and actually painted George Washington seven times. 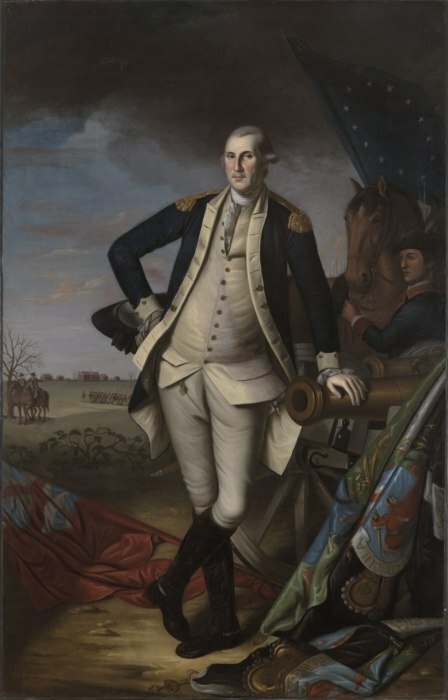 Peale's portrait of Washington called George Washington after the Battle of Princeton is said to be one of the most accurate physical portrayals of Washington. This painting shows Washington after the Battle of Princeton. Peale was personally present at this battle and fought on the front lines during the climax of the battle. The 13 star Betsy Ross flag can be clearly seen in the background. The problem is that this battle took place 6 months before the Flag Resolution. Was the 13 Star Flag already being used before the resolution was passed? Some scholars think so. Others disagree. More about the Betsy Ross Flag here. Many documentary sources indicate widespread use of the 13 Star Flag beginning in the fall of 1777, matching the date of the Flag Resolution's passage in June of that year. 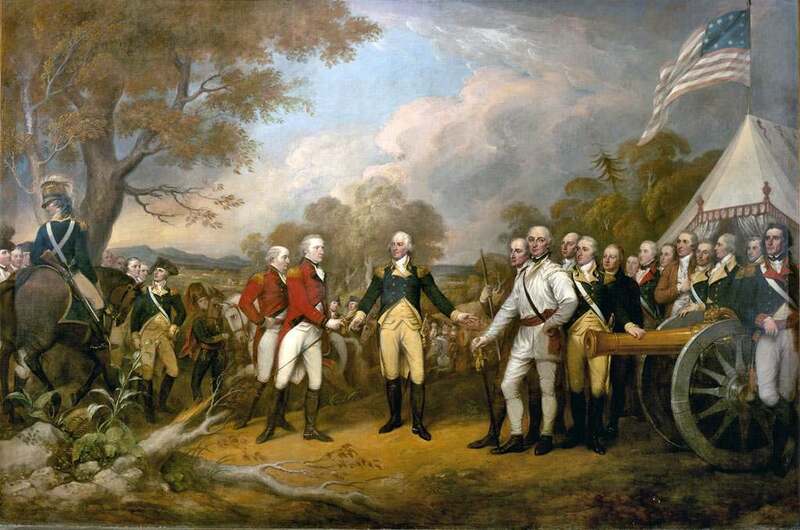 Such a painting is Jonathan Trumbull's Surrender of General Burgoyne which took place in October, 1777. The 13 Star Flag is clearly seen in the picture. Trumbull, however, painted the 13 stars in varying patterns in different works, leading some scholars to question whether Trumbull was painting from first hand knowledge, or simply adding in what was popular at the time he made the paintings. 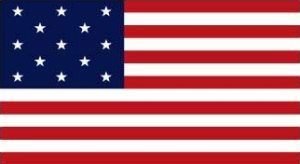 Other facts make the question of whether or not the 13 Star Flag was used extensively by the Continental Army seem less clear. One such source is a series of letters written between George Washington and Richard Peters, who was then the Secretary of the Board of War. In the letters, Peters is trying to get General Washington's approval for which flag he desires to be used for the army. The problem is that this exchange takes place two years after the Flag Resolution was passed. If the flag was decided upon by Congress in 1777, why is George Washington still trying to decide which flag to use 2 years later? This lends credibility to the idea that the 13 Star Flag was used mostly by the navy in the first few years. Original letter from Richard Peters to George Washington of May 10, 1779, asking what the official flag of the army is. In this September 3, 1779 letter from Richard Peters to George Washington, Peters sends Washington drawings of several flags, asking him for his suggestions and which he prefers, one suggestion for a marine flag having a serpent in the middle, similar to the First Navy Jack Flag. This is George Washington's reply to Richard Peters of September 14, 1779, he indicates that he prefers an army flag with the British Union in the corner and the snake in the center with the number of the regiment and the state. Obviously no such flag was ever used or came into prominence if it was. All of these discrepancies make proving many points of the flag's development very difficult. Some things are certain, others are clouded in mystery. Consequently, all we can do is to inform you of the various relevant facts concerning each 13 Star Flag. 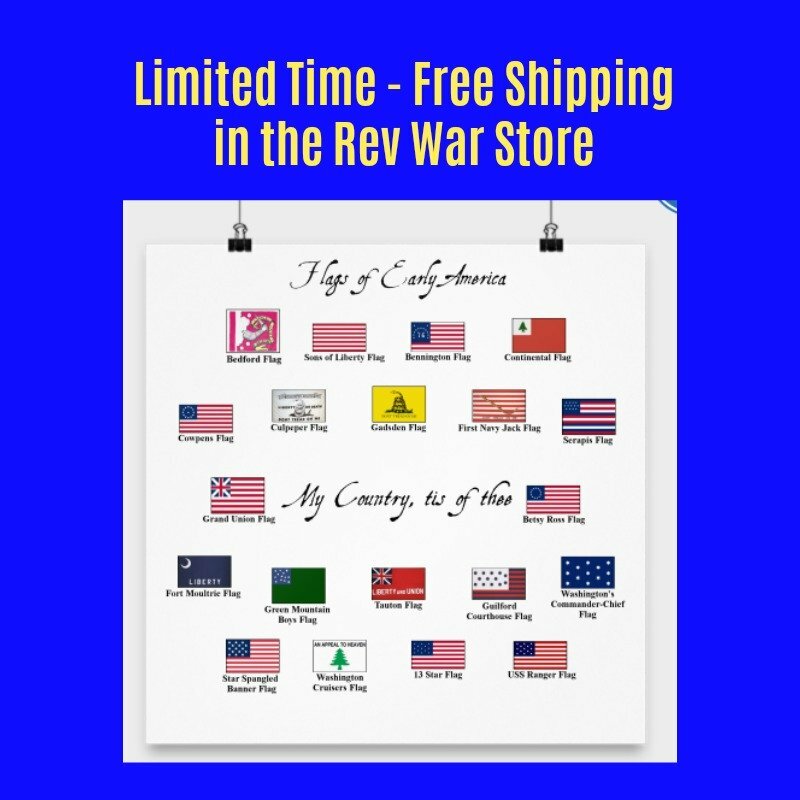 Order Historic Flags here. One of the most well-known 13 Star Flags is also commonly called the Hopkinson Flag. Francis Hopkinson was a Congressman from New Jersey who signed the Declaration of Independence. Hopkinson was an amateur talent who created many songs, poems, drawings, etc. He was the Chairman of the Continental Navy Board's Middle Department, under the Marine Board. In this position, he had great influence in determining the policies and procedures of the navy and it would not be unreasonable to assume that he had some influence in regard to the choosing of a navy flag. Francis Hopkinson is the only person to claim creating the first flag of the United States of which we actually have proof. In a letter written in 1780 to the Board of the Treasury, Hopkinson submitted a bill for creating the first flag and for various other artwork, such as for the Seals of the Boards of Treasury and Admiralty, the Continental Currency and other official designs. The bill was eventually rejected by Congress on the grounds that many people had contributed to the design of the flag. This has led some scholars to reject Hopkinson's claim. Some historians also discount Hopkinson's claim because he resubmitted the bill a few days later with a significant change. This time he changed the wording and asked for remuneration for creating the United States Navy flag, instead of for the United States Flag. Hopkinson claimed that he created the flag. Hopkinson was Chairman of the Naval Board's Middle Department, overseen by the Marine Committee, at the time the Flag Resolution was passed in June, 1777. The resolution was submitted to Congress by the Marine Committee. Hopkinson was a prominent amateur artist. He had created many poems, songs, drawings, etc. and was a known expert on heraldry (flags) having been appointed to a committee to prepare a Great Seal for the American Philosophical Society in 1770 and to help design the Great Seal of New Jersey in 1776. All of these facts make it seem reasonable that Hopkinson would have been selected to help design the flag for the navy. Hopkins submitted a bill to Congress for remuneration for creating the United States flag on May 25, 1780. This is the only documented claim from someone to have created the first American flag. 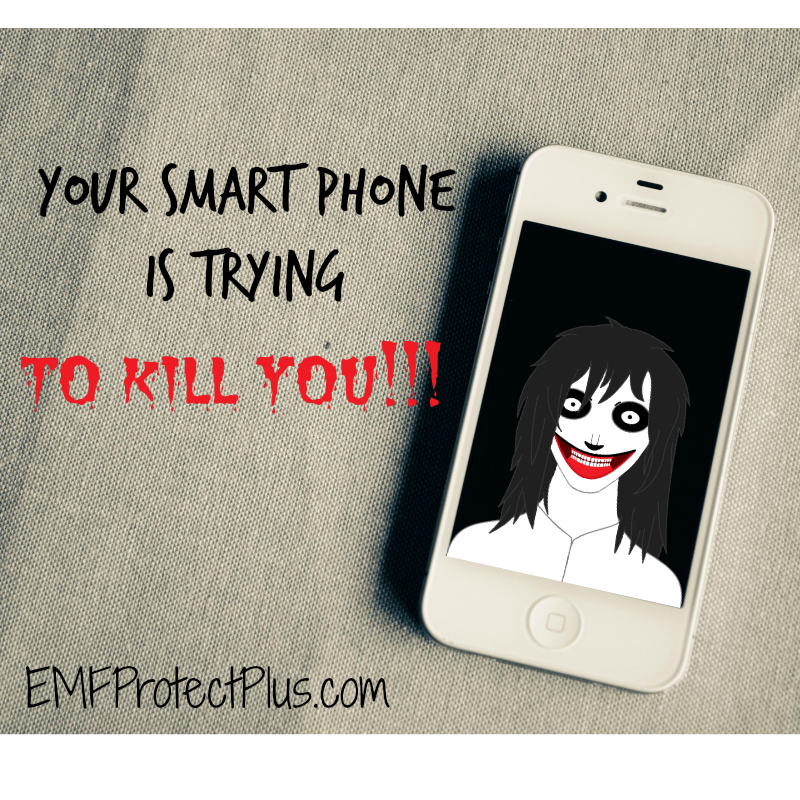 Read the bill - Francis Hopkinson letter to Congress of May 25, 1780 here. Some historians discount this letter because Hopkinson resubmitted the letter a few days later asking for remuneration for the United States Navy flag, rather than for the United States flag. Read the resubmitted bill from Francis Hopkinson to Congress of June 6, 1780 here. Some historians believe the naval flag and the army flag were one in the same. In his role as Chairman of the Navy Board, it is reasonable to believe that Hopkinson would have something to do with creating the navy's flag. If this is the case, the wording of the letters asking for remuneration isn't relevant because they were one in the same. Once Hopkinson submitted his bill, the bill passed through several offices before finally being denied by the Board of Treasury. The bill first passed through the Commissioners of Accounts office and the Auditor Generals office. Both of these offices did not reject Hopkinsons's bill, but instead believed the bill was legitimate, sending it on to the next office for payment. The Auditor General sent the bill to the Board of Treasury who finally submitted it to Congress stating that the bill should be denied for 3 reasons. First, because the bill did not have accompanying vouchers as required by law. Second, Hopkinson was not the only person consulted in the creation of the said designs. Others contributed as well, so Hopkinson could not claim full credit for making them. Third, Hopkinson was already in the employ of the federal government as a Congressman and the creations were a part of his job. He should not expect extra compensation for having created them in the course of his duties in Congress. The bill was rejected by Congress. The Board of Treasury did not deny that Hopkinson had some role in creating the flag. Some have suggested there was a personal act of revenge in denying this payment to Hopkinson on the part of the Board of Treasury. At the same time Hopkinson was Chairman of the Navy Board, he was also Treasurer of Loans under the Board of Treasury. A bitter dispute developed between Hopkinson and the Board of Treasury at that time, leading to Hopkinson's resignation from the position. It would not be unreasonable to assume that the Board denied Hopkinson's request for payment simply as revenge. Most original 13 Star Flags in the 3-2-3-2-3 pattern contained six-pointed stars. Hopkinson was known to favor six pointed stars in most of his other work. He did not begin using five-pointed stars until much later. The horizontal red and white stripes are known to have come from the navy. The earlier Sons of Liberty flag and First Navy Jack Flag are examples. This is another fact that puts Hopkinson in the right place at the right time to lend weight to the idea that he created the 13 Star Flag since he was in the navy department at the time of the Flag Resolution. Francis Hopkinson's requested payment from Congress was denied on the grounds that he was not the sole contributor to the flag's design. Surely the Congress knew who had contributed to the flag? There is no drawing of any flag that Hopkinson may have submitted to Congress in the official records, so any flag design attributed to Hopkinson is purely speculation. A few days after submitting his bill to Congress, Hopkinson resubmitted the bill with a few changes. In the second bill, he asked for reimbursement for creating the United States navy flag, instead of for the United States flag. This may mean that he was not taking credit for the United States flag, but only for the navy flag. However, as was mentioned above, there is disagreement about whether the army and navy used the same flag initially or a different flag. It makes sense that Hopkinson would have something to do with the navy's flag because he was the Chairman of the Navy Board at the time. Some historians believe the flag that was chosen for the navy was eventually adopted by the army as well, but this is speculation. It is more reasonable to believe that Hopkinson was choosing a First Navy Jack Flag or an Alliance flag (more below) for the navy only. Most American navy ships had red and white stripes by this time as these flags do. The Flag Resolution of 1777 did not specify the layout of the stars for the new 13 Star Flag, it only said they should make "a new Constellation." Consequently, flags with many different patterns for the stars emerged. To pick this flag with the 3-2-3-2-3 pattern for the stars as "the" official flag is simply inaccurate. 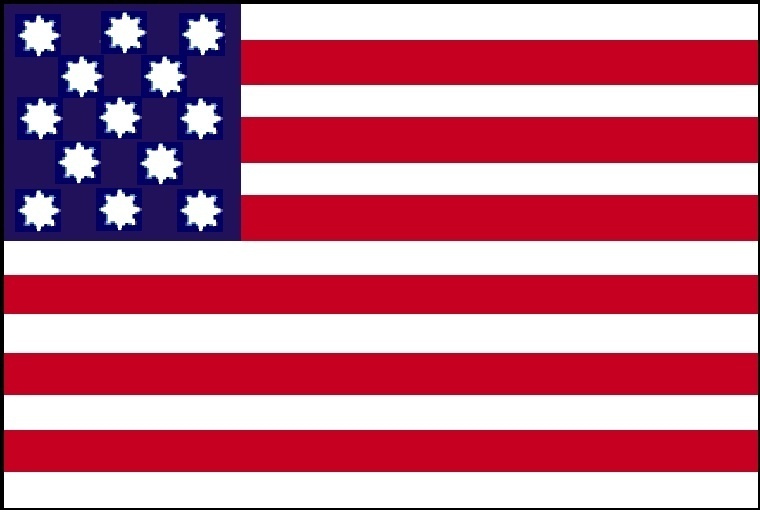 There are alternative sources for the first 13 Star Flag, such as Betsy Ross. Ross' story is unproved by documentary evidence as well, but, as with Hopkinson, there is a lot of circumstantial evidence indicating that she may have made the first flag. 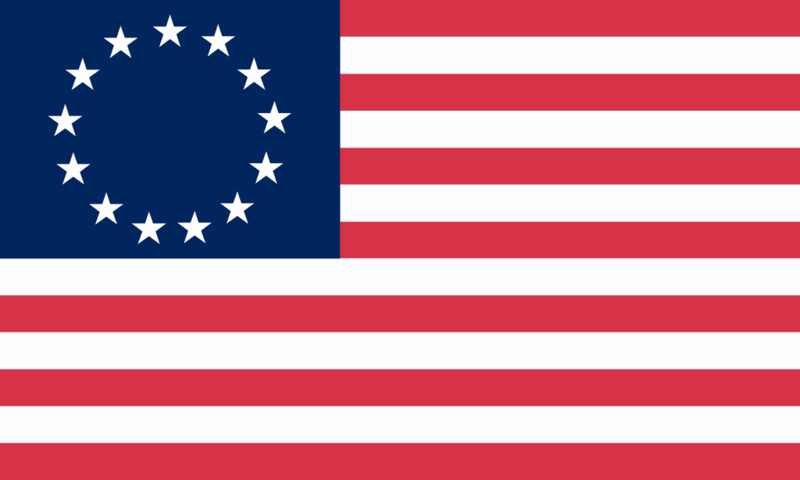 Another popular 13 Star Flag is the Betsy Ross Flag. The Betsy Ross legend is well known to Americans, but as with the Francis Hopkinson Flag story, its facts are far from proven. The legend goes that widowed seamstress Betsy Ross was visited by a secret committee from Congress in May or June, 1776. The committee consisted of George Washington, George Ross and Robert Morris. Ross was Betsy's late husband's uncle and a member of Congress from Pennsylvania. Robert Morris was also a delegate to Congress from Pennsylvania. He was known as the "Financier of the Revolution" because he used his great wealth to help pay for the war. Both Ross and Morris signed the Declaration of Independence. The committee allegedly asked Betsy if she could make flags. She said she never had, but didn't doubt that she could do it. Ross then pulled out a drawing of the suggested flag. 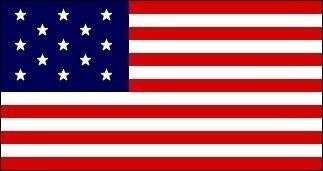 Betsy Ross looked it over and made a few suggestions to change it. Her largest contribution was to suggest that they use five-pointed stars as they were easier to make than the six-pointed stars in the drawing. She then pulled out some material and a pair of scissors and showed the men how to fold the material and cut a five-pointed star with one snip. The men were impressed and George Washington sat down in Betsy's parlor and redrew the flag incorporating Betsy's suggestions. 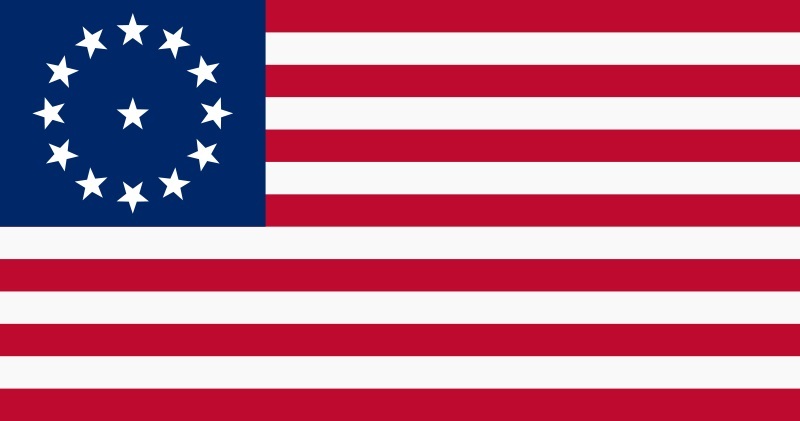 Betsy Ross made the first 13 Star Flag using the design and it was chosen by Congress. 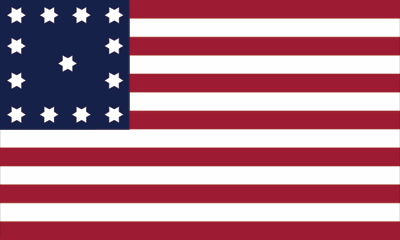 This flag then served several years as the first flag of the United States. 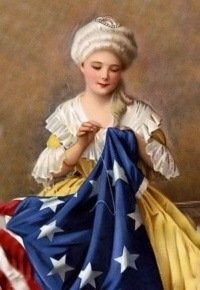 There are several problems with the Betsy Ross story. One is that Betsy said the event took place in June, 1776. The Flag Resolution was not passed until 1777. Also, there is no written evidence anywhere in the congressional record of this event. The sole source of information is William Canby, Betsy's grandson, and a few other relatives who said they heard her tell the story from her own mouth. In spite of this, there is a great deal of information to support the story, including Betsy's relationship with George Washington. They sat in pews next to one another at church and he allegedly came to her house for social visits and professional visits, using her tailoring services. You can read more about the Betsy Ross Flag controversy here and read more about Betsy's personal life at our Betsy Ross Facts page. Since the Flag Resolution of 1777 did not specify how the stars were to be laid out on the 13 Star Flag, flags with many different patterns, actually hundreds of patterns arose. The following are some of the more well known 13 Star Flags. 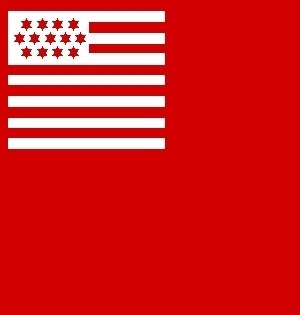 The Bennington Flag was allegedly carried at the Battle of Bennington where General John Stark and Colonel Seth Warner defeated a detachment from British General Burgoyne's army that was trying to capture the rebels' military stockpile at Bennington, Vermont. The colonists won the battle. 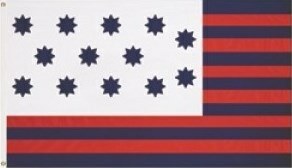 According to tradition, Stark's wife Molly Stark created the Bennington flag according to traditional rules of heraldry (flag etiquette), using six-pointed stars and putting the white stripes on the outside. The flag was allegedly carried off the battlefield by Nathaniel Fillmore who then passed it down through his family. President Millard Fillmore, the 13th President of the United States, was said to have once owned it. It was eventually given to the Bennington Museum in Bennington, Vermont by Maude Fillmore Wilson where it resides today. Some historians have doubted this traditional story, suggesting a date for its creation around the time of the War of 1812 or even the Civil War. More about the Bennington Flag here. The Washington's Commander-in-Chief Flag was created by George Washington in 1775 for his personal headquarters. It was flown wherever he was for the entirety of the Revolutionary War. It still flies today at Valley Forge. Notice that the flag has thirteen six-pointed stars. Washington is known to have favored six-pointed stars. 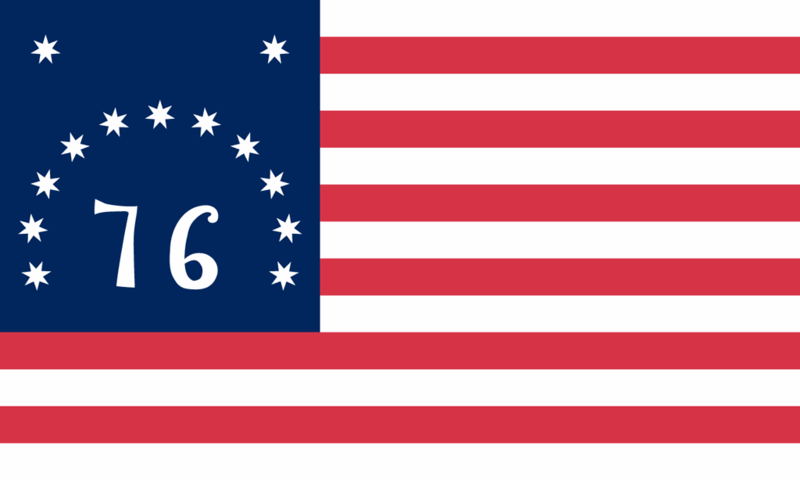 His use of six-pointed stars on this flag is one of the reasons that some people discount the Betsy Ross Flag story. They reason that since he liked six-pointed stars, he would not have approved of Betsy Ross' suggestion of five-pointed stars. More about Washington's Commander-in-Chief Flag here. The Brandywine Flag was carried by Captain Robert Wilson's company of the 7th Pennsylvania Regiment and received it's name after being carried into the Battle of Brandywine on September 11, 1777 about 3 months after the Flag Resolution. The legend goes that Captain Wilson needed a flag quick for the battle so this flag was painted on a plain red background from the description passed by Congress. Some stories indicate the flag may have been carried into battle at an earlier date at the Battle of Cooch's Bridge in Delaware on September 3, 1777. Captain Wilson may have also brought it to the Battle of Paoli on September 21 and the Battle of Germantown on October 4. The original Brandywine Flag still exists and is in the display at Philadelphia's Independence National Historic Park. The Brandywine Flag was featured on a US postage stamp in the year 2000 as part of the Postal Service's Stars and Stripes series. The Green Mountain Boys Flag was carried by a New Hampshire and Vermont militia unit commanded by Ethan Allen and his cousin Seth Warner known as the Green Mountain Boys. They captured Fort Ticonderoga from the British on May 10, 1775. The cannons and mortars they captured were moved across the wilderness to aid General Washington in driving the British out of Boston. The Green Mountain Boys served under Colonel John Stark at the Battle of Bennington, Vermont. On August 16, 1777 they succeeded in defeating General John Burgoyne and protecting the colonists military supplies at Bennington. The Green Mountain Boys Flag has stars arranged in a random pattern as was common in many flags from the period. You can learn more about the Green Mountain Boys Flag here. In 1777, the British army occupied Philadelphia, driving the Continental Congress to seek refuge elsewhere. The colonists had constructed two forts on the Delaware River to protect Philadelphia and to control the movements of the British on the river. Once Philadelphia was captured in September, the rebels still controlled the two forts allowing the colonists to prevent the British from communicating in or out of Philadelphia from the sea or from receiving supplies and reinforcements. Fort Mercer was built on the New Jersey side and Fort Mifflin on the Pennsylvania side, with ship destroying impediments beneath the water between the two. The British began to move to take the two forts. In October, General Charles Cornwallis arrived with 5,000 men that were landed 3 miles below Fort Mercer on the river. Fort Mifflin was destroyed in the largest bombardment in American history to that point, with over 10,000 cannonballs raining down on the fort's defenders. Half of the defenders were killed and the rest escaped. Rather than letting his men be captured by the gigantic British force, Colonel Christopher Greene abandoned Fort Mercer on November 20. It was captured by the British the following day. The Fort Mercer Flag flew over the fort. It is not known why the colors were reversed with white stars on a red field and white and blue stripes. The Serapis Flag, also known as the Texel Flag, was flown by John Paul Jones over the ship CNS Alliance as he sailed out of the Dutch port of Texel. Jones had captured the HMS Serapis in battle and sailed her into the Dutch port. He had no American flag to fly over the ship because his own flag had gone down on his ship the CNS Bonhomme Richard in the battle. The British Ambassador in the Netherlands demanded that the ship be turned over to England because it was not flying a flag identifying which nation it belonged to and was considered a "privateer" according to international shipping laws. The Dutch scrambled to prevent turning the ship over to the British. They contacted Benjamin Franklin who was then America's Ambassador in Paris. Franklin gave a description of the flag from what he had heard of Congress' Flag Resolution (although he had never seen one). The French and Dutch governments both accepted the description and a sample was drawn up by the Dutch government which proceeded to give a copy to Jones. Jones then had the flag drawn from the description, had the flag made and the Serapis flag was the result. Jones then flew the Serapis flag over the CNS Alliance as he sailed out of Texel and back to battle. 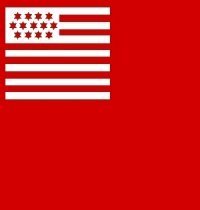 Read more about the Serapis Flag here. The Alliance Flag was flown over the CNS Alliance by Captain John Barry who is sometimes called the father of the American Navy. The Alliance was a 36 gun frigate built by the United States that was the finest ship of its kind built by the colonists to that point. The flag has seven white stripes and six red stripes, with 13 eight-pointed stars. Between 1781 and 1783, the Alliance captured 3 enemy privateers and 3 British warships, carried diplomats back and forth to France and fired the last shots of the American Revolution in a sea battle in 1783. Her final act during the war was to carry the Marquis de Lafayette back to France. The Trumbull Flag is named for Revolutionary War era artist John Trumbull who included a flag with 12 six-pointed stars in a square with a 13th star in the center. Trumbull included this 13 Star Flag in his famous paintings Surrender of General Burgoyne and Surrender of Lord Cornwallis. The paintings are included in the series of 4 large paintings in the US capitol's rotunda. The paintings were painted sometime between 1816 and 1824, but were based on earlier smaller versions he made in the 1780s and 1790s. Because of the arrangement of the stars, some scholars believe this 13 Star Flag was actually in the battles depicted in the paintings. Trumbull was well known for painting historically accurate depictions. Most, however, agree that the design was his own embellishment and some other design was actually in use at these battles. In July 1775, Captain John Hulbert led a group of Long Island militiamen to assist in the defense of Fort Ticonderoga. The legend goes that this 13 Star Flag was created before they left Long Island, or on the way somewhere during the Champlain Valley campaign. The company later led British prisoners back to Trenton and Hulbert gave a report on the mission to the Continental Congress in Philadelphia. The volunteer company was then disbanded and they returned home in January 1776. 150 years later, this flag was found in a house once owned by John Hulbert and was hailed as one of the oldest American flags. The Hulbert Flag has 13 stars and stripes with the six-pointed stars in a staggered diamond pattern. The USS Ranger Flag is the first documented flag of the United States Navy, though other flags were flown by the navy before. It was first flown by Captain John Paul Jones on the USS Ranger on July 4, 1777. This flag is very similar to the earlier Hopkinson Flag, except that its stars have five points instead of six points. Captain Jones sailed the Ranger to England where its marines went on shore and harassed British villages. The Ranger sank two British warships with more guns than herself. Jones and the Ranger also received the first formal salute from a foreign power to the Stars and Stripes when she was saluted by the French fleet at Quiberon Bay. This was not the first salute of a United States flag, but the first salute to the Stars and Stripes flag. The first salute to a United States flag occurred from the Dutch at Saint Eustatius, West Indies on November 16, 1776. The Dutch saluted the USS Andrew Doria, but she was flying the Grand Union flag, a flag with the familiar red and white stripes, but with the British Union Jack in the corner. The Grand Union was used by the colonists early in the war. More about the Grand Union flag here. The Cowpens Flag was allegedly carried into the Battle of Cowpens in January, 1781. This 13 Star Flag is one of the most popular American historical flags today. The Cowpens Flag actually belonged to the Third Maryland Regiment which was disbanded shortly before the battle. Some historians believe the members of this regiment then scattered, some joining General Daniel Morgan at the Battle of Cowpens. The battle was a decisive victory for the Americans, forcing British General Cornwallis to come to the aid of the defeated soldiers, leading to another devastating defeat for the British at Guilford Courthouse. Some scholars believe the whole story is incorrect though, believing the flag was not created until the War of 1812. The Cowpens Flag had 12 stars in a circle with a 13th star in the center. The original Cowpens Flag is in the State House in Annapolis, Maryland today. The famous painting Spirit of '76 by Archibald MacNeal Willard uses the Cowpens Flag. More about the Cowpens Flag here. Legend has it that the Guilford Courthouse flag was raised over Guilford Courthouse in North Carolina on March 15, 1781. This was one of the bloodiest battles of the Revolutionary War, with the British losing over 25% of their forces. The battle stopped the British advance through North Carolina and forced them back to the sea. The Guilford Courthouse Flag has an elongated canton (the upper left corner) and red and blue stripes. The 13 eight-pointed blue stars are on a white field. As with many of these 13 Star Flags, the origin of this flag is not certain and some historians have said it is probably from the War of 1812. Learn more about the Guilford Courthouse Flag here. The Bauman Yorktown Flag was drawn on a map by Major Sebastian Bauman a few days after the British surrender at Yorktown. It was later engraved by Philadelphia engraver Robert Scot and published. Bauman was a soldier from Germany who had served in the Austrian army. He came to America and joined the Continental Army, fighting in New York, New Jersey, and Pennsylvania. Bauman was in command of artillery at West Point before he joined General Washington at the Siege of Yorktown. Bauman took detailed records of the terrain and battle positions at Yorktown for his map. Because he created the map shortly after the battle, the 13 Star Flag appearing on his map is probably one he actually saw on the battlefield. The flag resembles the earlier Hopkinson flag with its 13 six-pointed stars, but with white stripes on the outside instead of red. The Simcoe Yorktown Flag was drawn by 26 year-old British Lieutenant Colonel John Graves Simcoe who was in command of the Queen's Rangers at Gloucester Point at the Battle of Yorktown. This 13 Star Flag was on the Americans right flank. Why the strange colors? Some historians believe Simcoe's position at Gloucester Point put the flag between himself and the sun. They believe the sun obscured the actual colors of the flag. Simcoe went on to become a successful Lieutenant-Governor of Canada, commander of the British forces in Haiti and was appointed Commander-in-Chief of India before his death. The Jonathan Fowle Flag was created by militia soldier Jonathan Fowle at Castle William in Boston Harbor in 1781 according to tradition. Fowle was serving at the Fort in the harbor when he created this 13 Star Flag and presented it to the fort. The fort was renamed Fort Independence after the Revolutionary War. Because of this, the flag is sometimes called the Castle William Flag or the Fort Independence Flag. 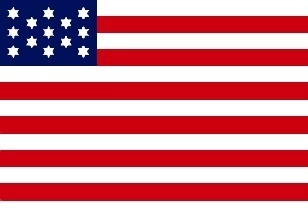 The Jonathan Fowle flag contains thirteen stars and stripes with the stars in a staggered 4-5-4 pattern with the points pointing in all different directions. The first British military vessel to arrive in Boston after the peace Treaty of Paris ending the Revolutionary War was signed was the HMS Alligator. It arrived in Boston Harbor from Halifax on May 2, 1791. British merchant vessels had sailed into Boston Harbor before this date, but the Alligator was the first military vessel. As tradition dictated, the United States flag was hoisted over the Fort when the Alligator appeared. The Alligator made a 13 gun salute and the Fort dipped her flag in response. This was the first official salute of the United States flag by Great Britain after the war. According to several accounts, the flag that was saluted by the British was the Jonathan Fowle flag, which was still in use at the fort in 1791. The Jonathan Fowle flag still exists today and is part of the Massachusetts State House Flag Collection. Order your own 13 Star Flag here and help support this website with your purchase.